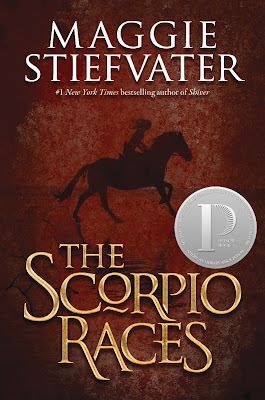 Book Adventures: (YA) Scorpio Races by Maggie Stiefvater + Recipes! (YA) Scorpio Races by Maggie Stiefvater + Recipes! 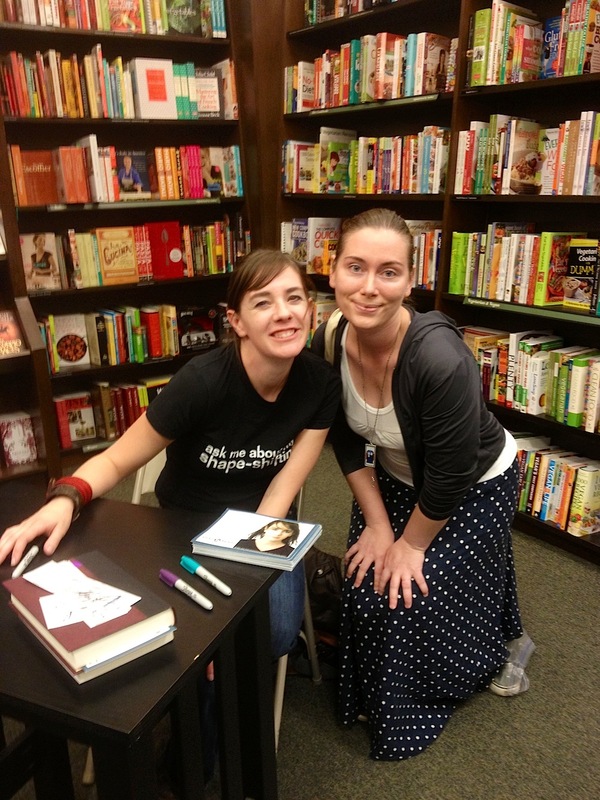 This past Monday I was able to meet YA author Maggie Stiefvater at the Orem Barnes & Noble on tour for her newest book, The Raven Boys (first in a four book series). Along with The Scorpio Races (which this post is about) and The Raven Boys, Maggie is also the author of The Wolves of Mercy Falls trilogy and the Books of Faerie series. Maggie is a very animated person and told stories as if she were onstage. She's a writer, artist, and musician, so I wouldn't be surprised if a little drama worked it's way in their too. In reference to The Scorpio Races, Maggie told us how she and her sister had a horse when they were young and how they would ride it around the neighborhood and sometimes into people's garages. Maggie is a wildie. Also, for research for The Scorpio Races, Maggie journeyed to cliffs in both the US and Europe. 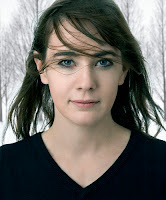 Maggie is part of the YA author group The Merry Fates, made up of herself, Tessa Gratton, and Brenna Yovanoff. Check out their site for short stories by all three. For specifically Maggie's stories, click here. And just FYI, Warner Bro's has optioned The Scorpio Races for film. EDIT: Focus now has the film rights and is moving forward (as of Nov. 2014)! Read the first three chapters of The Scorpio Races. Download the Scorpio Races discussion guide. 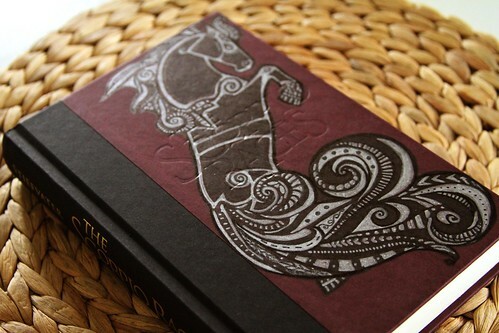 The Scorpio Races offers a unique twist on the Kelpie/Water Horse mythology, set on a fictional island in the known world. The island of Thisby is Ireland-esque and Maggie conveys the stark and haunting atmosphere well. The time setting is not clear but is most likely, at the least, in the 20th century. The specific range though is the month of October and the first day of November--so appropriate to post about right now. The pace of the story is somewhat slow because of much description and journal-type thoughts and observations from the main characters, one boy and one girl, but not enough to make me put the book down. I was definitely invested in the characters and wanted to follow their development and decision making in the context of the main backdrop of the story, the deadly Scorpio Race. The mythology and superstitions in the story are very organic and weave a strong foundation for the two main characters. The main themes of family, loss, and identity stand out in the stark backdrop of Thisby and the upcoming races. I also appreciate Maggie's handling of the developing relationship between the two main characters because they both remain independent and strong. Man-eating horses from the sea are the foundation of The Scorpio Races. Maggie said that her first attempt at incorporating this mythology into a story was to write about a water horse shape-shifting into a man, but after a couple of less-than-desirable results, including a story called The Horses of Roan, and many years in between, she decided to take the basic idea of dangerous horses from the water and create her own mythology and specifics. What she came up with in The Scorpio Races is a powerful backdrop to the life and struggles of the main characters. Here's some more info. about water horses. Most are deadly. The ones I'm familiar with from childhood (reading, not experience) are the Púca and the Kelpie. Maggie made this trailer for The Scorpio Races! Artwork and music! She is uber talented. To download Maggie's Scorpio Races MP3, right click here and "save link as". Maggie has always wanted to write books with palpable descriptions of foods (like the "goluptuous" butter pies in Diana Wynne Jones' A Tale of Time City, an example Maggie has given) and she has succeeded in that regard in The Scorpio Races. There is mention of tiresome beans, apple cake, potatoes in broth, chicken and dumplings, homemade bread, cinnamon twists, biscuits (the cookie/cracker kind), normal tea, and then the more detailed November Cakes and butter and salt tea. 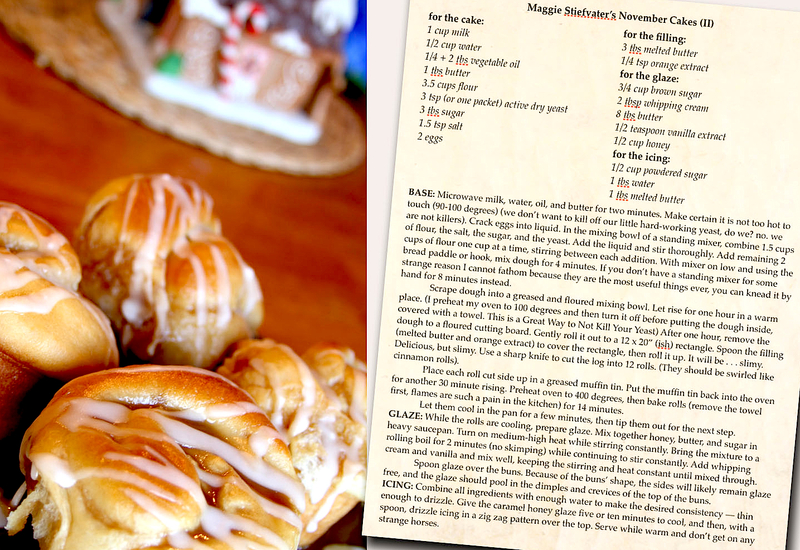 Below you will find Maggie's very own recipe for the gooey November Cakes along with a recipe I found for the unique tea, which come to find out is a common Tibetan drink called po cha used to combat the cold (including chapped lips). This would come in very handy on Thisby during the time the story takes place (Fall). The tea serves as an element that further portrays the character of Malvern (the one who drinks the tea) as eccentric and well-traveled (as only wealthy people can be). EDIT: Click here for my recipe post for November cakes & salted butter tea! Boil the milk with the teabags for 2-5 minutes. Add sugar and using a whisk, dissolve and then add butter and salt to taste. Whisk thoroughly so that it is foamy and the butter is completely emulsified. * Maggie will also be on a special Twitter chat, #askmaggie, #psychicstory, on Oct. 23rd @ 7pm EST / 5pm MST with @ThisIsTeen.